At the Mining World Russia, International Exhibition for Mining and Processing of Minerals and Metals (April 9-11, 2014, Moscow), Beumer Group will present systems solutions in the conveying technology sector. Furthermore, the company will inform visitors about its customer support that ensures trouble-free operation of the systems even under the harshest conditions. 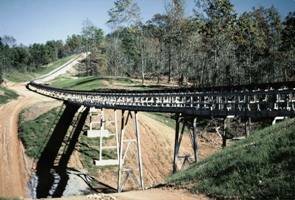 Beumer Group offers curved belt conveyors, used for the transportation of various raw materials like coal or ores, even over long distances and often through rough terrain. These conveyors are designed as troughed belt conveyors or pipe conveyors. Material transport with belt conveyors is generally faster, more cost-efficient and environmentally friendly than trucking. As more and more clients in the bulk industry want to commission their systems in a turnkey state, Beumer Group is not only component provider, but in many cases general contractor. matched individually to the respective needs of the customer and range from maintenance and inspection to long-term placement of service personnel on site. CEMA 576 – Classification for Conveyor Belt Cleaners: What it means for designers, manufacturers and users.